You negotiate daily even if you don’t realize it. Whether it’s asking for a raise, choosing a restaurant to meet for lunch, or bargaining with your teenager, you’re a negotiator. Negotiation skills have never been more important. There are fewer good jobs available and conflict around the world is commonplace. But, while negotiations are common, bargaining effectively doesn’t come easily to most people. Good negotiating skills must be both learned and developed. Experience is necessary. Most negotiations are ineffective, take far too long, and result in at least one of the parties feeling bitter about the process. Relationships of all types can be permanently harmed by common negotiating practices. How well does the agreement meet the needs of both parties? It’s not all about you. If you put your customer out of business due to your high prices, you lose a customer. Or they might choose to go somewhere else next time. Is the agreement efficient? Not only should an agreement be reached in a reasonable amount of time, it should also be practical and workable. Too many unnecessary details create an agreement that’s difficult to comply with or to enforce. The relationship between the parties should be improved, or at least maintained. If the relationship is harmed in any way, it is not an ideal agreement. If you get what you want, but lose your best long-term client, or infuriate your significant other, the negotiation wasn’t successful. Many negotiations fail if measured by this set of criteria. You might not be negotiating multi-million dollars deals every week, but you do negotiate each day with those around you. The same concepts still apply. Learn to negotiate effectively, and you’ll get more of what you want and strengthen your relationships at the same time! Without rapport, communication isn’t happening at the highest level. Those people that everyone seems to like, the people with great charisma, are masters at establishing and maintaining rapport. You don’t have to be born with the gift of gab. The techniques of creating rapport are well-established. With the proper information and some practice, you can become an expert communicator. Speak more slowly. When you speak too quickly, you sound like a used car salesman. Those that speak rapidly are often viewed as less trustworthy. Slower speech puts people at ease. However, you don’t want to speak too slowly. If the other person is thinking, “I wish this person would pick up the pace,” you’re not building rapport effectively. Evoke sympathy or assistance. We feel closer to someone when we feel sorry for them or provide assistance to them. We enjoy being sensitive and altruistic. It’s good for the ego. Be open with the other person and allow yourself to be vulnerable. Ask for a favor, even if it’s just a glass of water. Once someone does something nice for you, they’ll be more likely to be accommodating in the future. We all like to be consistent. Whether you want to be a great salesperson or become the most popular person you know, listening is the key. Hardly anyone listens intently anymore. The average person is too busy scrambling for the next thing to say. It’s not possible to listen at the same time. Or, they already know what they’re going to say and they’re impatiently waiting for their turn. No matter how suave you think yourself to be, others can easily notice when you’re not listening. Give the other person your full and undivided attention. Validate the other person’s opinions. After listening intently, validate the other person’s opinions and thoughts. It’s not necessary to agree with them, but acknowledge that you understand their point of view. Ask questions that show you’re interested and want to understand better. How, why, when, and where can lead to a high level of rapport. Take the time to find out more about what was just said. You’ll be amazed by the response you receive. You may be the first person that has shown an interest. It may sound simple and trite, but we naturally respond positively to someone that looks us in the eye and shows a genuine smile. Mirror the other person. Adopt the other person’s body language as your own. Be careful! You don’t want to be viewed as mimicking or mocking. Sit or stand in a similar fashion. Have similar gestures and mannerisms. Use similar vocabulary. You can test how well you’re mirroring by attempting to lead the other person. Scratch your nose or sit back and see if they do the same. When you have a high degree of rapport, they’ll mirror you! These simple techniques can be done by anyone. Smile, be pleasant, and give your full attention. There’s little else required. Imagine dealing someone that displayed those three simple traits. You’d be thrilled to spend time talking with them. Give rapport the attention it deserves. Your negotiations will be much more successful. This is the type of bargaining most familiar to the average person. It can occur when haggling over the price of an item at a yard sale or creating a peace treaty between two nations. Each side adopts a position, fights for it, and ultimately makes concessions until an agreement is reached. Customer: This lamp is interesting. How much are you asking for it. Owner: It’s pretty amazing, isn’t it? I’d be willing to sell it for $100. Customer: Are you serious? There’s a big scratch on it. I’d pay $25. Owner: I’ll entertain serious offers, but that’s not serious. Customer: I guess I could pay $30. Owner: I could accept $80. Owner: I paid more than $35 for it. In positional bargaining, each party defends a serious of positions as concessions are made. You can become locked into your positions. By taking a position, you’re forced to defend it. By defending it, you become committed to it. The more you claim that you can’t change your position, the less ability you have to do so. Your ego becomes involved. If you say you can’t go lower than $80, you’re forced to admit that you’re a liar if you do. Positional bargaining is adversarial by nature. We naturally want to win. Future negotiations can be negatively affected by the outcome of the current negotiation. If you feel you lost this round, you’ll be more determined to win the next interaction. Positional bargaining often leaves one party feeling negatively about the interaction. Positional bargaining is a slow process. It might not take long to argue over the price of a lamp, but positional bargaining can be an inefficient process when the stakes are higher. For example, management and unions can spend weeks or months arguing over small details of a new contract. One of the tactics commonly used is stalling. One or both parties take an extreme position and refuse to concede in hopes that the other party will ultimately acquiesce. It can ruin the current relationship. Once each side has chosen a position, reaching an agreement becomes a battle. Each side attempts to force the other to make concessions. Relationships can be destroyed. It doesn’t support kindness. The emphasis is on winning, rather than on reaching an agreement that works for both parties. Being kind during positional negotiations leads to a poor result for the party attempting to be kind. When the relationship is given priority, one or both parties will be left with a poor agreement. When you adopt a soft negotiating style, you’re at the mercy of someone that negotiates more firmly. The other party is aggressive while you’re doing everything you can to avoid a confrontation. Positional negotiating is common, but it’s not the best way to negotiate. There are several disadvantages to reaching an agreement this way. An agreement that meets the needs of both parties is rarely attained. In most cases, at least one party is left bitter by the process. While positional negotiations are the norm, there are other options that provide better outcomes. By separating the people-related issues from the issues under negotiation, a better solution can be reached. When you’re making or receiving concessions to address relationship issues, the negotiating process is less effective. It’s also important to seek a solution that meets the needs of everyone involved. It’s not a process for taking as much as the other party is willing to give. That type of thinking is short-sighted. The issues at hand. Whether it’s the price of a lamp or the details of a nuclear treaty, there’s a reason for the negotiation. Each party has its own reasons for negotiating in the first place. Each side has an objective. The relationship between the two parties. In most cases, there’s more at stake than just the central issue. The quality of the relationship is also at stake. You might win the battle with a long-term customer, only to have them find another supplier because of the nature of the negotiation. You might bully your spouse into going on the vacation of your dreams, only to suffer the consequences of your tactics over the next six months. The value of the relationship between the parties is important to consider. It’s too easy to take the position of the other person personally and have it affect the relationship. Positional bargaining requires an examination of both the importance of the issue and the importance of the relationship. Concessions are made in one area to emphasize the other. While dealing with your wife or your best customer, the relationship will take precedence. Deal with the relationship issue directly. Rather than have the relationship issue intertwined with the reason for the negotiation, separate it. Express emotions openly, but without blame. Deal with the challenges of others by using psychological techniques. Avoid solving people problems with concessions in negotiations. Focus on prevention. The easiest way to deal with a challenge is to prevent it. Build and develop a relationship before the negotiations begin. Predict the challenges that are likely to occur and develop a strategy to avoid them. Keep the interests of both parties in mind. Forget about positions. Instead of taking a position and defending it to the death, understand the interests of both sides and seek to satisfy both. This allows for multiple solutions, rather than just a compromise between two opposing positions. Focusing on the interests addresses the primary issue. Just because someone’s position is opposite to yours, doesn’t mean their interests are opposite to yours. A 3+% raise to save face with my union members. A decrease in the health insurance premium. The cost of the current insurance has risen faster than salaries. An extra two days of vacation for new employees. The current allotment doesn’t allow new employees to take a week-long vacation with their families and have any additional time off for personal matters. A stable, well-trained workforce at a reasonable cost. A workforce that is willing to accommodate overtime, without insisting that seniority be the only criteria for filling those overtime slots. The expertise of the employees needs to come first. Understand their priorities and share your own before discussion solutions. Now is the time to create a strong position. Question their priorities. Restate their priorities in the form of a question. If you present your proposal first, and then justify it, you’re not being effective. Once you propose a solution, the other side immediately begins formulating a response. They’re not listening to your reasoning. Explain your priorities, and then offer a solution. Stay focused on the present. The past is irrelevant. What do you want to see happen in the future? Know what you want before beginning negotiations. It’s common to start negotiations without an objective in mind. Beginning the process with the sole intention of seeing what the other side is willing to offer is a mistake. Seek solutions that result in mutual gain. This can be challenging. Each side already believes it has a viable solution. Unfortunately, that solution rarely considers the needs of the other party. Everyone believes their solution is a reasonable one. Avoid starting with preconceived ideas. Is your perspective objective, or is it clouded by your past experiences and opinions? Avoid looking for only one answer. There are often multiple solutions that are equally good. The idea of a single, perfect solution can get the way of meaningful resolution. Be open to multiple solutions. Avoid judging ideas until you have several of them. When you judge each possibility, it inhibits the process. Let the ideas flow. Then you can analyze them and decide if they’re suitable. Agree on objective criteria. If negotiating a price, agree to search for a fair price. You might provide a figure and justify it. The other party then does the same. The objective isn’t to pay the least or to give away the most. It’s to find a price that’s fair. Then the solution was arrived at objectively, rather than through pressure. Not everyone will approach a negotiation with your enlightened attitude. Remember that most are students of the school of positional bargaining. Expect the other person to take an aggressive approach. Be prepared. Avoid responding in similar fashion. The objective is to bring them over to your way of thinking, not to beat them at their own game. Remember, no one wins at their game. There are always two losers in the end. Avoid the urge to teach them a lesson. You have the best of intentions and believe they do not. It’s natural to want to punish them. Ask yourself if you want to reach an agreement or be right. Focus on establishing ground rules. Explain your theory on negotiating, preferably before the proceedings begin. Try to get everyone on the same page. Address ineffective tactics as they arise. Call them out on the table. Explain that you understand their tactic and then explain why it’s ineffective. Offer a more effective solution. This is the best time to propose a more effective process. Avoid falling into someone else’s trap. Be confident that you have a better way of negotiating and gently move the other person to your way of thinking. Avoid taking anything personally. Maintain your composure and offer practical solutions. 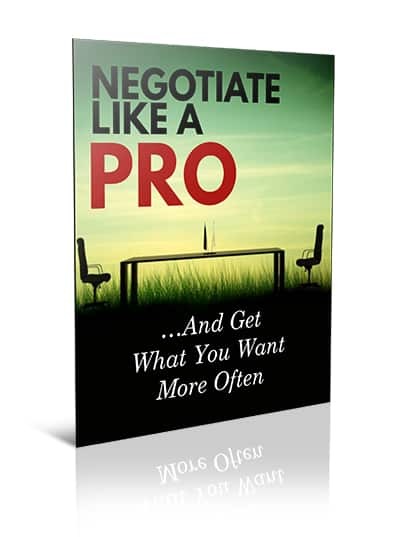 Negotiating skills have never been more relevant. You’re negotiating on a regular basis with your boss, friends, family members, neighbors and strangers. Enhancing your negotiating knowledge and skills will provide great rewards. These questions will help you gain a perspective of your current negotiating skills and determine how you can strengthen them. When do I negotiate in my life? Make a list of the negotiations you participate in each week. Have I left negotiations in the past feeling bitter? What outcome would have left both parties feeling better about the process? What three actions can I take today to enhance my rapport skills? What can I do to counteract someone that is negotiating aggressively? What are the pitfalls of positional negotiating? Do I have a tendency toward this type of interaction? How can I bargain differently? How would my life improve if my rapport and negotiating skills were greatly enhanced? What mistakes have I made in the past when negotiating? What can I learn from these mistakes? All of this information might seem like common sense, and it is. However, negotiations are rarely undertaken by two parties demonstrating common sense. The two primary obstacles to effective negotiations are ego and greed. There is an innate ego-based need to win that must be controlled. The greed component is the result on erroneous thinking. You’ll win the most in the long-term if you’re able to maintain or improve the existing relationship. Forcing your neighbor to trim his tree is hardly a victory if his resulting anger results in four flat tires on your prized 1967 Mustang. Find solutions that meet both of your needs. Leave your ego at the door and consider the importance of your relationships. You’ll be glad you did!